When Alexis de Tocqueville travelled to the United States in 1831 and 1832 he was struck by the energy of American democracy. Americans, he observed, were continually engaged in governing themselves and that engagement spilled over into the economy and society generating an uncommon vitality. A primary reason for this energy and vitality was America’s decentralized political system. Through the Constitution’s system of federalism power was divided between national and subnational governments allowing citizens to decide local questions for themselves. This decentralization he contended draws individuals out of private life and compels them to civic engagement. Federalism is one of the great innovations of the American Founders. Before the American Constitution, governments were either national with all power concentrated in a central government or confederal with individual governments retaining sovereignty and voluntarily cooperating for limited purposes, like the Articles of Confederation that preceded the Constitution. The idea that power over individuals could be shared between a national government and multiple state governments was new. The system created by the Constitution was so new that that the authors did not have a word for it so they changed the meaning of the old word “federal”. At the time federal simply meant confederation. What did Madison mean when he said that the Constitution was neither national nor federal? Madison first noted that the national government itself embodied federal features in its composition. State legislatures controlled who would vote in the Electoral College and how Senators would be elected in the Senate. Amendments to the Constitution required the approval of the states. But the best way to answer this question is to consider the nature of the powers delegated to the national government and those reserved to the states. The national government has “enumerated” powers listed in the body of the Constitution and the authority of the national government does not extend beyond them. Some of those powers, such as taxation, are concurrent powers which means that both the national government and state governments can exercise them simultaneously. The principle of enumerated powers also implies that if the Constitution does not grant a power to the national government that it is reserved to the states. For the Founders the great benefit of this system was that it would help prevent a dangerous accumulation of power in one level of government. James Madison said in Federalist No. 51 that the division of power between state and national governments along with the system of separation of powers created a “double security” for the rights of the people. But the Framers thought that federalism would also improve the quality of government. Limiting the national government to decide questions of national importance would prevent it from having to decide questions requiring local knowledge. And allowing states to decide questions of local importance would allow for innovation and diversity among the states. In a nation as vast as the United States it would be unwise, they thought, to impose a uniform policy except when needed on the entire country. Today, for instance, should we expect vast, less-populated western states to have the same speed limits as smaller congested, densely-populated states on the East Coast? Or should Mississippi have to have the same gambling laws as Nevada? Technically, since the Constitution only refers to the national government and the states, federalism only refers to a division of power between them. But more broadly federalism embodies a fundamental principle of decentralization of power, the decentralization which so impressed Tocqueville. Americans govern themselves not only through their state and national governments but also through a myriad of subnational government including counties, municipalities, school districts, and “special districts” such as water and transportation authorities that perform particular functions often across multiple jurisdictions. This vast array of governments allows for competition among them to attract residents and businesses. These “consumers” can select the government that offers the best basket of goods and services for their needs. This competition makes government responsive to the demands of citizens. Municipalities, for instance, know that if they levy exorbitant taxes that produce little apparent benefit or higher taxes that do produce benefit to their residents, those residents can move to a more congenial jurisdiction. Since the Founding the relationship between the national government and state and local governments has dramatically changed. Almost always this change has been in the direction of concentrating more power in the national government. The period prior the Civil War was the closest America came to a system of dual federalism where there was little overlap in the functions of the national and state governments. A primary reason for this was that the national government had relatively few functions, the most prominent being delivering the mail. Most federal employees prior to the Civil War worked for the Post Office, a fact which prompted the quip that the United States was a post office with a government attached. The Civil War had profound effects on American federalism. Most importantly, it was a war and wars are always centralizing events. Carrying them out requires taking power from the periphery and bringing it to the center. But most importantly, as a practical matter it settled the debate over whether the Constitution was a compact from which the states could secede. Interesting theoretical discussions still occur on this question but politically the Civil War settled the debate against secession. Three Civil War Amendments, the Thirteenth, Fourteenth, and Fifteenth, were added to the Constitution. Respectively, these amendments would forbid slavery, guarantee due process and equal protection for all state citizens, and forbid denying the right to vote based on race. Sadly, the promises of the Fourteenth and Fifteenth Amendments would not be fulfilled until well into the twentieth century. Shortly after Reconstruction ended southern states instituted a system of segregation laws (known as Jim Crow laws) aimed at keeping the races apart and denying blacks basic civil liberties. The personal income taxes collected by the Internal Revenue Service has in large part funded the twentieth-century administrative state. But it would be Franklin Roosevelt’s domestic agenda, the New Deal, that would bring about the most decisive transformation of American federalism. Responding to the Great Depression, Roosevelt created an immense administrative apparatus to regulate the American economy. Over a hundred agencies were established. 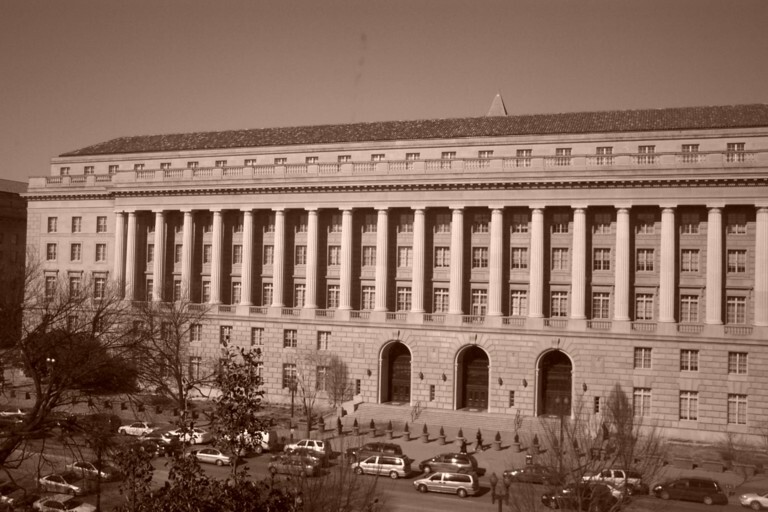 Often referred to as “alphabet agencies” these offices regulated everything from housing through the Federal Housing Administration (FHA) to airlines through the Civil Aeronautics Authority (CAA). But while the national government established more and more programs, it often relied on the states to implement those programs. Primarily the national government used grants to entice states to carry out federal initiatives. Largely nonexistent prior to the New Deal, grants became and remain the primary way that the national government controls the states. Importantly, these grants always come with conditions. The federal government requires that in order for the states to receive the grant, they must accept certain conditions. States are free to reject the grant and the strings that come with it, but in practice states find it all but impossible to forego federal money. Two of the more noticeable examples of the imposition of a nationwide policy through grants were the twenty-one year old drinking age established by the National Minimum Drinking Act in 1984 and the educational requirements of the No Child Left Behind Act (NCLB) passed in 2001. With the former, Congress required states to adopt the policy in order to receive federal highway funds and the latter stipulated that federal education funding was contingent the implementation of NCLB. Additionally, during Roosevelt’s presidency, and at his urging, the Supreme Court dramatically loosened its interpretation of the Commerce Clause. 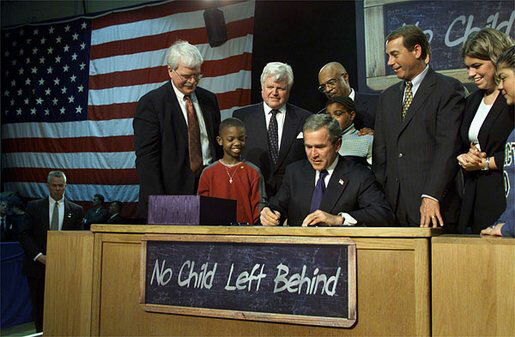 President George W. Bush signing the No Child Left Behind Act (2001), which brought billions of federal dollars and federal control into local education. The Commerce Clause the Constitution gives Congress the authority to regulate interstate commerce. Starting in the 1930s, the Court began expanding what Congress could regulate under the clause. Eventually it established a “substantial effects” test which held that activity unrelated to interstate commerce could still be regulated if in the aggregate it had substantial effects on interstate commerce. Under this test the Court went so far as to hold in Wickard v. Filburn (1942) that Congress could regulate the amount wheat that farmers grew for personal consumption. An Ohio farmer, Roscoe Filburn, admitted that he was growing more wheat than his allotment permitted but used that excess only on his own farm and was not selling it. Growing wheat for private consumption, he argued, was not commerce of any kind, much less interstate commerce, and not subject to Congressional regulation. But according to the Court, by growing extra wheat on their own land farmers like Roscoe Filburn would not be purchasing wheat and that would affect the interstate market for wheat. Thus government could regulate production for personal use. The next major expansion of federal power over the states occurred during Lyndon Johnson’s presidency. The Civil Rights Act of 1964 became the primary lever for ending segregated schooling in the South. In the ten years following the Supreme Court’s 1954 decision in Brown v. Board of Education almost no meaningful desegregation occurred. Under the Civil Rights Act the federal government could withhold education funding from unlawfully segregated school districts. The threat of losing federal funding convinced previously convinced segregationists to reconsider their commitment to segregation. And it was the Voting Rights Act of 1965 that dismantled Jim Crow laws designed to prevent blacks from voting. Johnson’s “Great Society” program dramatically increased the use of grants to fight a “war on poverty.” The consequences of those programs remain contentious between liberals and conservatives. In the fifty years since Johnson launched his war, America has spent over $20 trillion on anti-poverty programs but the percentage of American officially living in poverty, fifteen percent in 2014, has remained the same. These less than encouraging results have led conservative scholars to argue that instead of alleviating poverty, the war on poverty entrenched it and bred dependency on the government. Defenders of the war on poverty argue that while it did not end poverty, it did alleviate some of the worst fears facing the poor. There are both conservative and liberal critics of the official poverty measure who argue that the standard of living of the poor has dramatically improved. On many other measures such as lifespan, level of education, housing, car ownership, and access to modern conveniences like computers the lives of the poor have dramatically improved. Johnson’s presidency also saw the beginning of what came to be called unfunded mandates. These are requirements that Congress imposes on state and local governments and the private sector but provides no funding to meet them. Often these mandates support laudable goals such as clean air or access for the disabled. But they shift the burden of funding them to state and local governments which are limited in their ability to raise additional revenue. State and local governments cannot print money and often are forbidden from running deficits in their state constitutions. Because Congress does not have to consider cost exaggerates, it avoids the difficult but necessary calculation of the most efficient use of tax dollars. Congress does not have to consider what economists call opportunity cost—whether a dollar spent on one program would be better spent on another or not at all. Since opportunity cost is necessary for rational decision-making unfunded mandates compel state and local governments to inefficiently and irrationally allocate their limited resources. While state and local governments have clearly been on the losing end of a nearly two-century trend toward increased centralization, it would be a mistake to think that they are irrelevant. For most Americans, state and local governments remain than ones that most directly affect their lives on a daily basis. State and local governments have been policy innovators in areas such as welfare and education reform. The most important welfare legislation of the past two decades, the Personal Responsibility and Work Opportunity Reconciliation Act of 1996, was modeled on reforms implemented in the states. And states and local school districts have been responsible for most of the education reforms, particularly in troubled urban school districts, that have provided increased opportunities for parents to select schools best suited for their children. Ultimately, since the Constitution guarantees the states’ existence, questions of federalism and the intricacies of governing in a compound republic will always be at the heart of American politics.